Out of 50 participants, 31 voted Taco Bell to be their favorite, and 19 voted Taco Bueno to be their favorite one. Fitted below are some charts made in preparation for this poll. That’s it folks, the great debate is done, gone, ended, no more, dead, finished, etc, etc. You don’t have to worry anymore about who likes what and why. 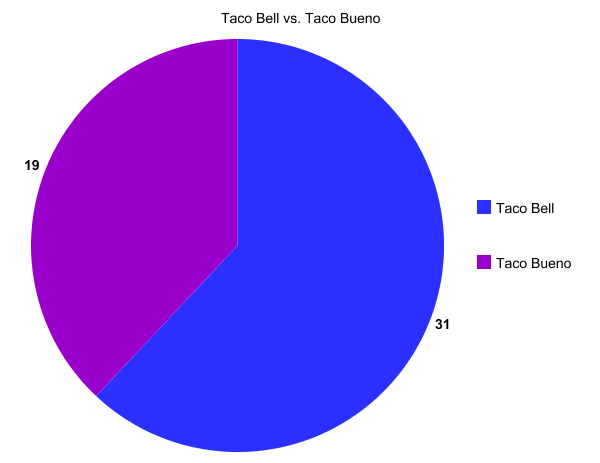 Taco Bell is widely favored over Taco Bueno. Some of the reasons for the people’s choices were: ease of location, choice of food, menu variety, having a dollar menu, cleanliness, architecture and many more reasons. There are also a lot more Taco Bells per square mile than there are Taco Buenos, so that may also have an effect. 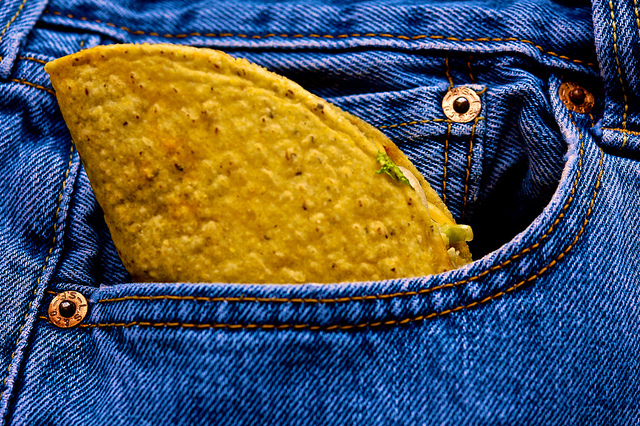 Another reason why Taco Bell might be more popular than its opponent is that it was founded before Taco Bueno was. Taco Bell was founded in 1962 and Taco Bueno in 1967. Even though this is not a very substantial difference between the two, it must’ve had some sort of effect as far as popularity goes. Ad campaigns also make a huge difference on how consumers react to a restaurant; if a commercial says that they are good, customers will go in expecting the food to be good. Taco Bell is also much more of an industry titan than Taco Bueno, having locations all over the world, having more ad space not only on television, but in movies and billboards all over the country. So, does it actually taste better, or is it just more favored because it is marketed to seem like it tasted better? We may never know, but something we do know is that more people prefer Taco Bell when compared to Taco Bueno.